Counter-Strike: Global Offensive's transition from a premium model to free-to-play and the addition of a battle royale modecco unsurprisingly resulted in a player spike. According to research firm Newzoo's PC Game Tracker, Valve's tactical online shooter was played by 16.7 per cent of core PC gamers around the world in December 2018, a rise of 39.3 per cent month-on-month. Overall, the game made up 3.6 per cent of the total amount of time spent playing games by core PC users for the month, from 2.9 per cent in November. The shift to free-to-play also resulted in Valve closing the gap on League of Legends firm Riot in terms of core PC fans playing their games. 24.3 per cent of this userbase played a Valve title for the month - up four per cent from November - and only just behind Riot's 24.4 per cent. The LoL studio maintains its No.2 position in the publisher rankings, but only just. 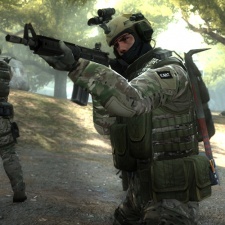 The most popular region for CS:GO was Latin America, where the game was played by 26.7 per cent of core gamers, a rise of 35.7 per cent year-on-year. The highest increase in player share was the United States, where Counter-Strike: GO was played by 14.8 per cent of users. That's a 47.5 per cent rise. As well as increased interest in CS:GO, Newzoo observed an effect on similar titles, too. The firm reckons that the addition of battle royale and the change in business model resulted in 27.9 per cent of US Fortnite users that played the game in November tried out CS:GO instead. That figure is even higher for Playerunknown's Battlegrounds at 33 per cent, but the largest switch was from Rainbow Six: Siege. CS:GO was the second most popular game for December 2018, rising two places, behind League of Legends, while Fortnite took third place. Epic's battle royale title dropped one place, as did Hearthstone which charted at No.4.